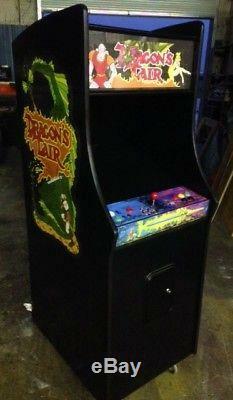 Item: This item is a professionally built full size upright arcade video multi game machine. It is designed to play a very hard to find collection of 12. A new 23 LCD/LED/IPS professional any viewing angle monitor. New powered stereo sound system with subwoofer, volume control pod, and headphones jack. Built-in new 1,000 joules surge protector with RF filtering. All new commercial quality mechanical and electronic components. Front bottom kick plate to protect the cabinet finish from kicks and scratches. 3-inch poly wheels for easy moving and easy on all floor types. New LED marquee back light (not an old flickering florescent bulb). Size: We designed our full size upright cabinet to look just like many of the classic game machines you remember. 25" wide x 33" deep at the control panel x 73 high depending on casters or levelers. Condition: This machine is brand new inside and out. Photo: The machine in the photo is the default appearance example of the subject of this listing. There are several free options available to change the appearance of your machine. See the following Appearance Options that allow you to customize your machine to look the way you want. Appearance Options: There are several free finish options available to help you customize your machine. You can change the cabinet paint color from black to any paint color you can imagine. You can change the 3/4 wide T-molding around the cabinet edges from black to any of eight available colors. You can change the control buttons to any of 6 available colors. You can change the joystick ball color from red to black. And, you can choose a clear or black kick plate. Freeplay: Unless you request differently, the machine will be set up for home use freeplay (not for coin-operation) with a front access vault door. Games: 12 classic hard to find Laser Disc style of games. The destination name and address. If a business, with a dock or not, and. Time: Your order is for a brand new arcade machine custom built from scratch. There are many steps required until your receipt. Machine build from scratch (we do not pre-build our custom machines). If ordered, your custom underlay design, and then your design proof approval. Final systems testing and final inspections. If you have any questions about the item, its condition, or its function, please contact me before purchasing. Feedback: Feedback is always appreciated and reciprocated. So, please leave feedback, and I will do the same for you. So, if there is any problem, please let me know and I will try my best to fix it. The item "Dragon's Lair / Space Ace Arcade Video Multi Game Machine" is in sale since Sunday, September 16, 2018. This item is in the category "Collectibles\Arcade, Jukeboxes & Pinball\Arcade Gaming\Video Arcade Machines". The seller is "aceamusements" and is located in Arlington, Texas. This item can be shipped to United States.